Over the last decade, fighters hailing from Ukraine have burst onto the boxing scene, accruing noteworthy professional careers. Most notably are the Klitschko brothers - Vitali and younger brother Wladimir. Vitali Klitschko is the current WBC Heavyweight champion, while Wladimir Klitschko presently holds the WBA, IBF, WBO, IBO and Ring Magazine Heavyweight titles. 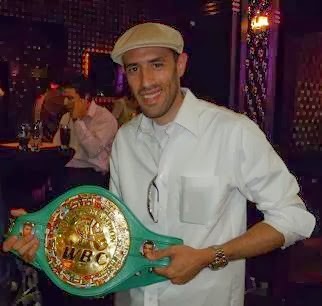 However, there are many others, including super middleweight Vitali Tsypko, light middleweight Andrey Tsurkan, one-time WBA World Bantamweight champion Volodymyr Sydorenko, and his twin brother, light flyweight Valeriy Sydorenko, previous WBA Welterweight champion Viacheslav Senchenko, once WBO Junior Middleweight champion Sergiy Dzinziruk, and former WBA Light Welterweight champion Andriy Kotelnik. With all the aforementioned fighters at age thirty-five or older, boxing is thirsting for some new blood from Ukraine. Ivan "Junito" Redkach, a 26-year-old lightweight phenom, has punched his way to the top of the list. Redkach was born in Shotska, Ukraine, a city with a population of approximately 85,500 in the north eastern part of the country, and home to the famed Ukrainian football team Impuls Shotska. Redkach is a fearless and relentless natural-born southpaw, who possesses deadly power in both hands. As an amateur, Redkach amassed a stellar record of 260 wins with only 40 losses, and was named as an alternate for his native country during the 2008 Beijing Olympics. So far as a professional, Redkach's record stands at a heart-stopping 14-0, 12 KO's with six of his knockouts occurring in the first round. Redkach was turned on to the sport when his cousin, Yuri Liberov, took him to a boxing gym at the very young age of six. "I broke my nose in sparring and it made me want to do it more," said Redkach. "I wanted to go back and improve my skills." Along his journey, Redkach met his manager Edward Gumashyan, who has worked with numerous Ukrainian and Russian fighters through the years. Gumashyan helped bring Redkach to the United States. Now, Redkach resides and trains in Los Angeles, California. "We like training in the warm, sunny weather," explained Gumashyan. "We also get better sparring on the west coast." Redkach is a highly versatile athlete. He increases his strength and conditioning through track and field activities, and includes playing soccer as part of his training regimen. He also demonstrates an adept ability to absorb a solid punch, which is something that cannot be taught in any gym. In preparation for his most recent victory, a first-round stoppage of Sergio Rivera inside New York City's acclaimed Roseland Ballroom, Redkach sparred a multitude of rounds with IBF Lightweight champion Miguel Vazquez, and unbeaten Russian lightweight contender Denis Shafikov. Redkach's head trainer, Mario Morales, has been diligently working in the gym with Redkach on improving combination punching and defense. "We want to utilize a variety of combinations, but the key is knowing when to unleash them," described Morales. "I want him to double-up his right jab, and be tricky with his right hooks and right uppercuts." Today, Redkach recognizes his style was better suited for the professional ranks. Yet, he believes his amateur pedigree makes him unconquerable. Gumashyan is quite pleased with his young prizefighter's progress at the present time. "His maturity from his amateur days is probably the greatest resource in his arsenal," acknowledged Gumashyan. Not to say that other promising boxers are not dedicating themselves properly to secure affluent careers, but Redkach exhibits a unique desire to be successful that is seen vividly through his lionhearted approach in the ring. He greatly admires the fighting styles of Fernando Vargas, Miguel Cotto and the late Edwin Valero. Where does Redkach's endless appetite for glory emanate? "I was born with it," boasted Redkach. "I want to win a world title at 135 lbs. Then, I want every big name at 140 lbs." Redkach added, "I'll take any fight they put in front of me!" Gumashyan commented, "Whoever Lou Dibella wants us to fight, we'll always be more than ready." Redkach's ambition and propensity to reach the sport's apex appear firmly within his grasp in due time, and doing so will crown him Ukraine's next boxing virtuoso.